BAY CITY, Texas — More than 3,000 residents were without power here on Saturday after Hurricane Harvey made landfall, but neighbors on Hillcrest Drive were taking good care of each other. Most were elderly or recently retired couples who had dealt with hurricanes in the past, from Carla to Rita. The most recent storm did not intimidate them. "The only flooding we had is when I couldn't flush the commode," Gus Svatek, 87, told NBC News, as he stood on his porch during a light drizzle. Svatek said he had moved into his house in 1956 and had ridden through a few storms — including 1960's Hurricane Carla — with his wife of 61 years and three kids. One of his daughters, Carolyn Salazar, 60, lived just three houses up the street and walked over in a pair of shorts in the late morning. Her mom had taken a bad fall that required stitches, so she strolled over to check on her folks. Evacuating, to her, was never an option. "Those are my parents," she said, swinging her head toward her parent's home. "They're not going to leave, and I'm not going to leave 'em." "Those are my parents. They're not going to leave, and I'm not going to leave 'em." Salazar had retired from working full-time, but still took a few shifts at the local hospital's pharmacy. She had planned to stay there during the storm and work overtime, so people didn't have to come in. But the hospital evacuated late Friday night, and she spent the time checking in with other neighbors instead. The storm had taken out the power at a few homes, including at Louie Eti's house nearby. Salazar ran a long extension cord to their house — a improvised setup that could remain until as late as Wednesday. The power company told them it wouldn't make any repairs until Hurricane Harvey had completely passed. Inside the Eti's home, a fan kept the heat and humidity at bay. They had put plywood over their windows during the storm, but had never feared flooding. Their house is close to the highest elevation in the county. "It was pretty wicked last night," said Eti, 62, who had retired from a career at TexDot. "The power went out and I made the call [to the power company]. It was raining real hard and the wind was whipping real hard. We were up for a good bit last night." Though their two grown children implored Eti and his wife, Mary, to evacuate, they ignored their pleas. "I want to be here if it did flood because I got to take care of my stuff," Mary Eti said. "I worked long and hard to earn this home." "And you never know," Salazar added. "People still loot." "Not in this neighborhood!" Mary quipped. "We're in Texas — they know we got guns." Mary Eti went to the extension cord to check a small flip cellphone that she'd plugged in. She was charging the cellphone of her elderly neighbor who had also lost power. "She is giving us power," she said, referring to Salazar. "I'm charging their cell phone, and we're just taking good care of each other." Eti put the phone down. The battery wasn't yet full. Across the street, 81-year-old Myrna Grimes was preparing to cook food on a butane stove in her garage. The Etis had loaned it to her after her power went out. Her husband — 91-year-old Callier Grimes, who suffers from back pain induced by tumors on his back as well as Alzheimer's — needed to eat. The elderly couple's power had been out since Friday and the Grimes were growing increasingly worried. Hearing that the power company wouldn't come until after the storm wasn't encouraging. "It's very uncomfortable," Myrna Grimes said, pushing her two large dogs away. "I'm on two different breathing apparatuses and I have lung problems." 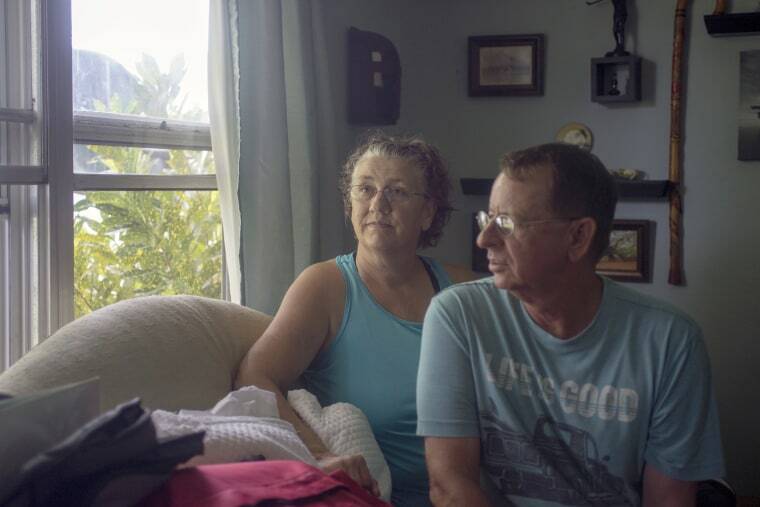 She said she had slept through storm with the help of her blood pressure medicine and a sleep aid, but the loss of power had pushed her to open the windows on Saturday. Rainwater seeped its way in. Myrna said she wasn't sure what to do. Her husband's nurse had visited the day before and told her that if anything drastic happens to call 911. The police would help them evacuate. But she was concerned for her husband and his illnesses. "He's been on a tear this morning," she said, indicating her husband. "There's days he does and days he doesn't, but the beautiful truth of it is that I can't afford to put him in a nursing home or leave this house. We don't have it." But she did have neighbors, and Mary Eti came by a few minutes later to let the Grimes' know that a boil advisory was in place for their water and that the phone was charged. "It's wonderful," Grimes said about her neighbors. "I don't know what I'd do without them."